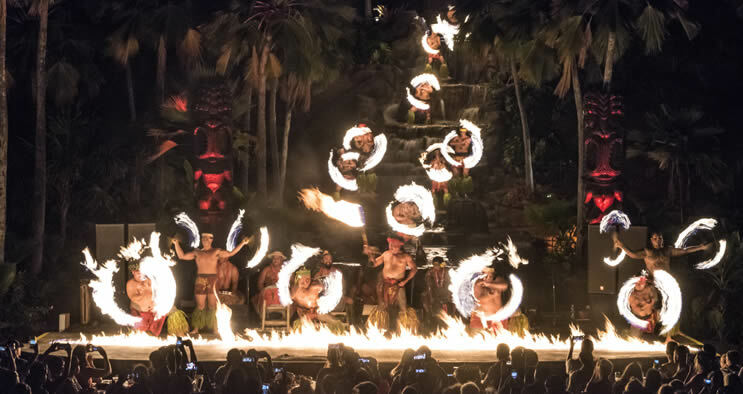 Chief's Luau takes place at one of Oahu's top visitor attractions - Wet N Wild Hawaii. This Hawaiian luau is fun for the whole family! This oceanfront luau takes place at the historic Royal Hawaiian Hotel, one of Waikiki's oldest hotels. Experience a true royal Hawaiian feast. Immerse yourself in Polynesian culture at this huge Oahu cultural park. Explore seven traditional Polynesian island villages and experience the award-winning Ali'i Luau. Enjoy an Oahu luau in the heart of Waikiki at the Hilton Hawaiian Village's rooftop garden. Fun pre-feast activities include a pineapple toss, a conch shell blowing challenge, a tattoo station and more! Held on a private beach on Oahu's leeward coast, Germaine's Luau is very family-friendly and offers a laid-back atmosphere, a delicious luau buffet and an exciting Polynesian show. What makes this Oahu luau special is its setting. Taking place at the Waikiki Aquarium, luau guests have access to all the aquarium exhibits prior to the luau festivities.